You take your German Shepherd for a walk and cannot seem to control its movement. This is a common problem that many GSD owners face and often avoid taking their dogs for a walk for that very reason. Leash pulling is normal behavior of a dog that can be controlled through continuous training and lots of patience. Make sure you are not getting frustrated and yelling at your dog because this will only make your dog react badly. Why Should You Invest Time in Leash Training Your German Shepherd? Walking on a leash is something that your GSD must learn starting at a young age. If your dog is troubling you or pulling on the leash when you take it for a walk, do not surrender. GSDs are active dogs that spend their time moving from place to place in their packs. If you keep them confined in a room or house, they will become destructive and depressed. However, taking them for walks will help keep them sane. Leash training allows the owners to have control over their dog’s behavior. It is extremely important that you train your dog to walk on the leash. When you make the dog walk on your will and your pace, you are telling it that you are the leader. 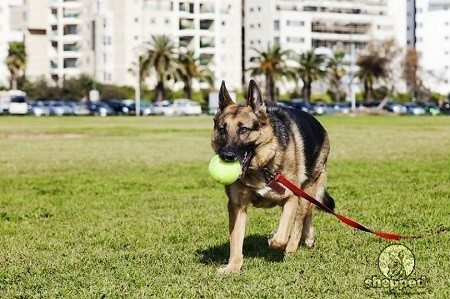 Read on to a few tips that will help you walk your GSD on a leash without pulling it. The size of the leash or harness you put on your dog directly impacts the way it walks with it. Do not buy a long and flexible leash for your GSD as it will create a communication gap between you and the dog. A leash that is flexible will allow your dog to walk ahead of you and roam around freely. It is better to buy a short leash but not a tight one. A tight leash can be harmful to your dog as it can suffocate it. A short leash will allow you to control your dog’s movement and prevent it from going in different directions. If your GSD tries to pull on the leash, pull it back with little force. Make sure you don’t pull it for too long as it will harm your dog. Pull a little and once your dog stops, go back to the relaxed state. If your GSD walks nicely without pulling on the leash and make sure you appreciate it. Offer a reward or treat every time your GSD walks at your pace without pulling on the leash. This way you will mark its good behavior and your dog will associate treats with walking nicely. Repeating this activity will make your GSD learn to walk properly on a leash. Another way you can make your GSD stop pulling on the leash is to pause. When your dog tries to move towards a desired place or object, do not let it drag you along. If you let your dog pull on the leash, it will take this as a victory and will continue to do so. The best thing to do in such scenarios is to pause or stop movement. Your dog will turn to look at you and will find that you are not willing to move in that direction. This will send out a clear message to your dog that you are the leader, and you will not go where it wants you to. If your dog turns around and notices that you are in a statue state but yet want to pull on the leash, turn around and start moving in the opposite direction. This is another way to tell your dog that it can only move in a direction you want it to. Warning: Do not pull on the leash too tightly as it will hurt your dog. Traditionally, your dog needs to walk at your pace on your left side. If your dog is moving in different directions instead of walking beside you, you need to act immediately. There have been incidents in which a dog’s back and forth movements have caused severe injuries to the dog and the owner. That’s why it is extremely important that you make your GSD learn to walk by your side. For this purpose, you will need a short leash. A short leash will allow you to have better control over your dog’s movement. If your GSD is moving from side to side, stick it to one side by offering treats on that side only. Repeat this activity several times until your GSD starts to pick the idea of walking calmly by your side. If your dog keeps pulling on the leash and moves in random directions, simply turn around and hold the leash tightly. Your dog will have no option but to move in your direction. Once it comes by your side, offer a reward to encourage the behavior. Many times a GSD won’t listen to you at any cost, whether you are pulling on the leash or giving it voice commands. This usually happens when you have the dog collar on the lower end of its neck. A perfect collar is the one that is on the neck rather than sliding towards the bottom of the neck. At the bottom of the neck is where the shoulders of a GS start and it has immense pulling power. However, positioning a collar on the upper neck will allow you to get hold of its sensitive area and when you pull it a little; your dog will stop to stay safe. 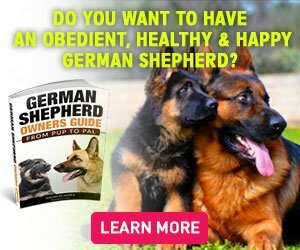 The German Shepherd Owners Guide; From Pup, To Pal Has Arrived!